“Time is flying! 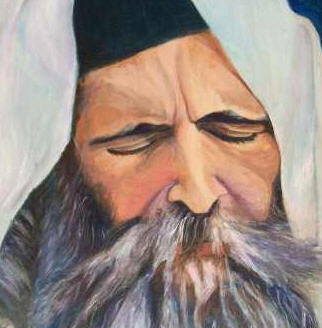 You’re getting older, but you don’t feel you’ve accomplished anything with your life.” Those were the opening lines to Everything is Possible, a pamphlet based on the teachings of Rabbi Nachman of Breslov that I was handed at the conclusion of our dinner at Salute Kosher Restaurant. The Hasid who fittingly choose that particular pamphlet for me was genial despite our initial reservations about accepting his pamphlets. He remained genial as he took our “tax deductible” contribution to Breslov City in the Galilee in return for the pamphlets. It was the least we could do after our feast of countless inexpensive shish kebabs at this self proclaimed, Uzbek-style restaurant. 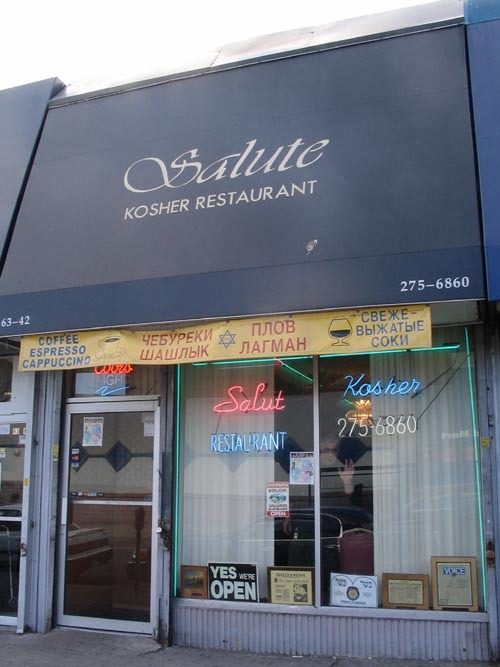 Salute Kosher was Eugene ’s second choice. La Kasbah, a Moroccan restaurant in Astoria , was his first, but the phone at the restaurant was no longer in service meaning the restaurant was most likely out of business, so the ever-diligent Eugene steered us to the Forest Hills section of Queens to Salute. Just as the cuisine of Tibet intrigued him enough to choose it in his last pick, the food from Uzbekistan now, for some reason known only to Eugene, piqued his interest. Suspicious eyes greeted Zio as he was the first to enter the restaurant. The regulars in this Uzbek-Russian enclave of Queens must have wondered what to make of the rotund stranger. The glares were too unsettling for Zio and he decided to wait for the rest of us outside the restaurant. Once Eugene announced his presence inside, however, the guarded looks eased. With his Sicilian-swarthy countenance, Eugene could pass for a Moroccan, not to mention an Uzbek. But when he opened his mouth, and despite reciting the one word of Russian he did know, it was obvious he was anything but an Uzbek. What he couldn’t express to the English-struggling waitress, he compensated by raising his voice until it was booming within the busy restaurant causing more than a few disturbing glances our way. He finally explained to the waitress that we were there to sample a good portion of the extensive menu. After that, language was no longer an issue. Though Mike from Yonkers had been excused, Rick, whose presence was in doubt, showed up just in time to sample the home made babaganush served with “national” bread. What distinguishes Turkish babaganush from, say, Egyptian, or Greek? The differences are subtle, and Salute’s Uzbek version had an intense creaminess that put it high on the world wide babaganoush meter. We followed that up with a platter of assorted smoked fish. The cured fish were salty and tough enough to survive the harsh winters of Uzbekistan. And I’m only assuming that Uzbekistan has harsh winters. 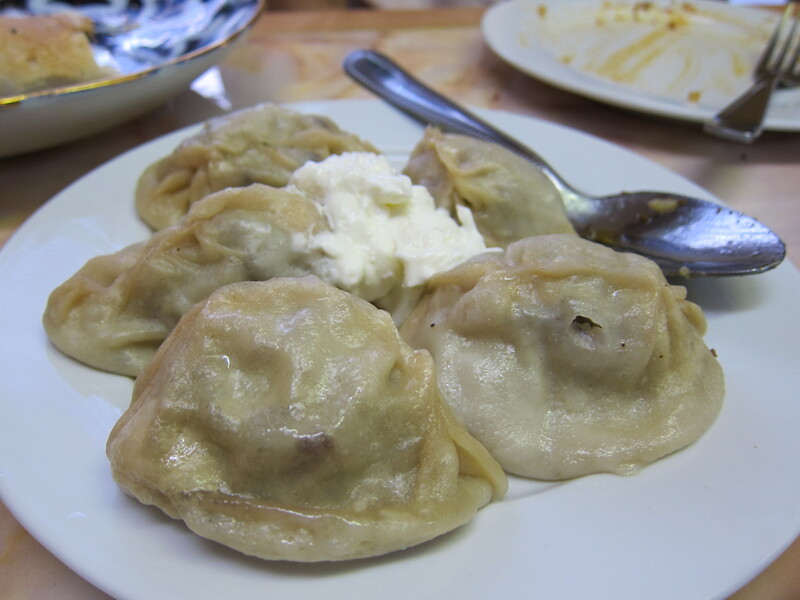 Our final appetizer was the Uzbek mantu, homemade meat dumplings whose gaminess, after the strong flavor of the fish, I, much to Zio’s horror, just could not tolerate. Even a swill from the Russian beer we were drinking could not extinguish the taste. Thankfully the parade of shish kebabs soon followed. We tried the lamb, the lamb ribs, the lula (ground seasoned lamb), the chicken with bones kebab, and the beef kebab (special cut). But this wasn’t enough for Gerry and Zio, who, in their gluttony, insisted we order another round of lula, chicken (with bones) and, because it was special cut, more beef. 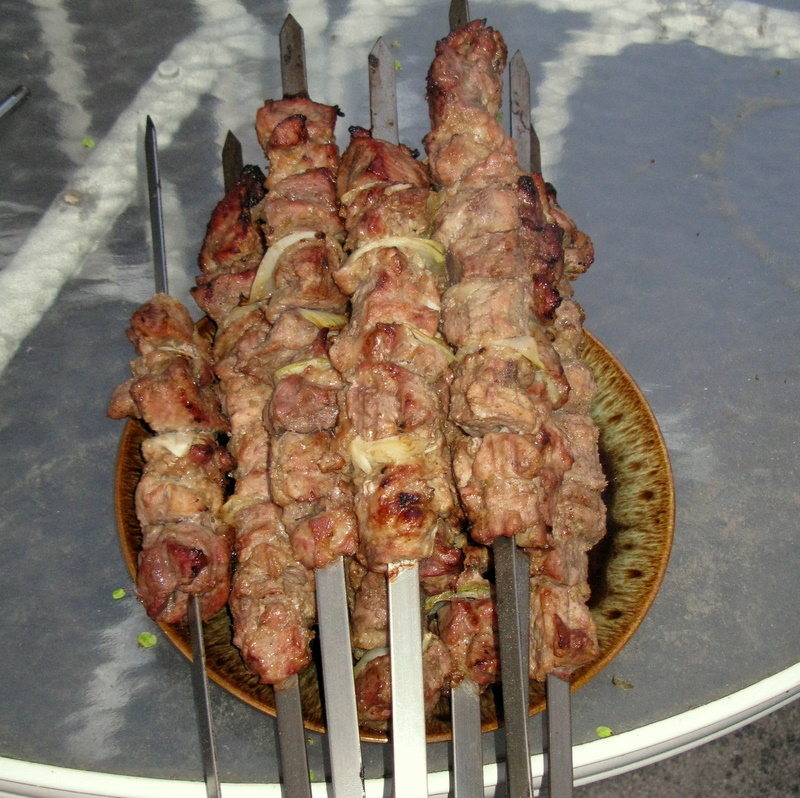 Now picked clean of their meat, the sharp-edged skewers on our table were piled dangerously high. Our waitress arrived soon and, without comment, cleared the cutlass-like utensils before Zio could use one to clean his teeth with. As we pondered dessert, a honey-noodle pudding in a box from the grocery store next door, the Hasid entered and despite our initial protestations passed out appropriate pamphlets to all of us. Flipping through “Everything is Possible” I noticed that, according to Rabbi Nachman, the drives—sexual, monetary, pride, eating, and drinking are “water-based” but can be controlled by giving your life back to “G-d.” I’m not sure if it was the forlorn look of the noodle pudding in a box or the words of Rabbi Nachman, that helped me decline dessert, but whatever it was, I made sure I stopped at the grocery store next door for a bottle of water for the ride back home.